Smog is formed when sunlight and its heat react with the gases and fine particles released into the atmosphere through burnt fuels. The complex photochemical reactions between the precursors like volatile organic compounds, sulphur dioxide and nitrogen oxides release the ground level ozone and fine particles in the air. Smog is often dependent upon the temperature. When it is the time for the temperature inversion, wind gets calm and creates the situation for the smog to get trapped over the area for few days. It becomes more severe in the areas which are farther away from the source of pollutant release. HOW DOES ANTI-SMOG GUN WORK? Anti-smog gun is used to spray water after connecting it with water tank mounted on a tower. It converts the water into a fine spray with droplets size of 20-10 microns by passing it at high pressure through propellers. The idea behind this invention is to reduce air pollution by binding dust and other particulate matter and carrying them down to the ground level along with water. This is been designed for small to medium properties like schools, hospitals, hotels, restraunt, banquets, farm houses, gardens etc. It basically works as rain to bring down the suspended particles present in the air. This device could be mounted any where and spray mist to settle all suspended particles. 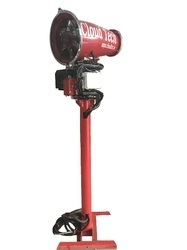 Anti smog gun for small areas can spray mist in 1200 sqmt area with the capacity of 30 litres per hr to bring down the polluted particles from the atmosphere. Looking for Anti Smog Gun ?